"The leading cause of death for Utah kids, ages 11-17, is suicide," she said during an episode that aired last month. "Suicide in Utah has increased 141 percent because of the shame they feel from the Mormon Church." DeGeneres was talking about Utah because singer and frontman Dan Reynolds of Provo's Imagine Dragons, arguably one of the most popular bands in the world, was on her show to discuss his Mormon faith and to promote his HBO documentary "Believer." The film is about Reynolds' effort to organize the LOVELOUD concert, the second of which is scheduled for July 28 at Rice-Eccles Stadium in Salt Lake City. The concert aims to champion love and acceptance for Utah's LGBT community through music. As DeGeneres and Reynolds highlighted on the show, Utah's youth suicide rate was a driving force behind LOVELOUD. And then DeGeneres read the provocative statement from a note card. Like many other states in the Intermountain West, Utah has a higher suicide rate than the national average. Those in the LGBT community are especially prone to attempt to take their lives. This has left people scrambling for answers, and, at times, someone to blame. Often that role goes to The Church of Jesus Christ of Latter-day Saints, which calls homosexuality a serious sin. The Church even labels those in same-gender relationships as "apostates" whose children require special permission to be baptized. It may be a frequently said that the Church's conservative stance has caused a rise in suicides, but proving it is another matter. Suicide research is difficult to conduct, in part, because those who have committed suicide can't speak for themselves. Justin Dyer, a religion professor and researcher at Brigham Young University, said the data aren't clear enough to tie the Church's teachings to the high suicide rate. "Sometimes we think, 'Surely somebody has a really good lock on exactly where those numbers are.' While a lot of times they are just estimates," Dyer said. Dyer, like many researchers, relies on numbers from the Centers for Disease Control and Prevention (CDC). The data aren't clear enough to determine causes. But one thing is certain - Utah has the country's fifth-highest suicide rate. "If the rate isn't zero, we have work to do" Dyer said. But when Dyer hears a statement like the one from Ellen DeGeneres, he worries it paints religion, in particular the LDS Church, with too broad a brush. "People often think that religion is just all bad and creates mental health problems," Dyer said. "In fact, the data show that the more religious you are on average the fewer mental health problems you have and the lower your suicidality." Youth suicide rates have risen steadily in Utah over the past decade. According to a recent study at the University of Georgia , more than 70 percent of LGBT Mormons surveyed met criteria for Post Traumatic Stress Disorder as a result of the teachings and sermons they heard at church. "We are inflicting trauma on our queer youth by asking them or requiring them to go to church," Kimberly Anderson, a transgender woman who left the LDS Church, said. "It's very clear." Anderson, who is training to be a therapist at the University of San Francisco, said she agrees with Dyer's position that those who embrace religion more have lower instances of suicide. But only as long as you're an "insider" in that world. "If you are an insider in that community then yes, religiosity is a tremendous protective factor," Anderson said. "The insider hears those messages and says, 'Oh yes, I feel loved, you must feel loved.' The outsider says, 'I hear those messages of love and I still don't feel loved.'" As someone who spent most of her life in the Mormon community, Anderson knows there are many messages of love. Anderson experienced this outside perspective first hand. It led her to leave the LDS Church. She said it's critical to address those feelings of rejection before someone becomes suicidal. It's not likely that the LDS Church will be embracing that message anytime soon. In the last month the Church released new suicide training videos, which are in line with research-based practices, but there was no mention of LGBT Mormons. For now, one group is trying to do what it can to save lives. During its annual international conference last Saturday in Salt Lake City, Affirmation, a group that serves LGBT Mormons, offered suicide prevention training to attendees, which included some local LDS leaders. The research-based curriculum is called 'QPR,' which stands for Question, Persuade, Refer. Much of the life-saving intervention training was devoted to dispelling myths, such as it's dangerous to ask someone if they're suicidal. Research shows that it's better to ask. One of the trainers, Wendy Montgomery, said her son came out as gay in his early teens and was suicidal for years. "I look at all of these suicidal kids and I see my son in every one of them," Montgomery said. "It immediately becomes personal to me." Suicide prevention should be a priority for every Mormon, Montgomery said, which is why she and other Affirmation board members went to the LDS Church to ask for support. And they got it. Through the Church's charity arm, LDS Foundation, Affirmation received $25,000 to pay for more QPR training. Montgomery would like to see every LDS leader trained to look beyond whether someone is straight, gay or transgender. And it shouldn't take data to convince people. "We're just trying to keep people alive," she said. "[Jesus] was the one who was always with the marginalized and on the outside, and the ones who were always feeling like they didn't fit in, that's who he spent his time with." In that spirit, Montgomery says it should be enough to know that just one LGBT Mormon is suffering from the messaging they hear at church. 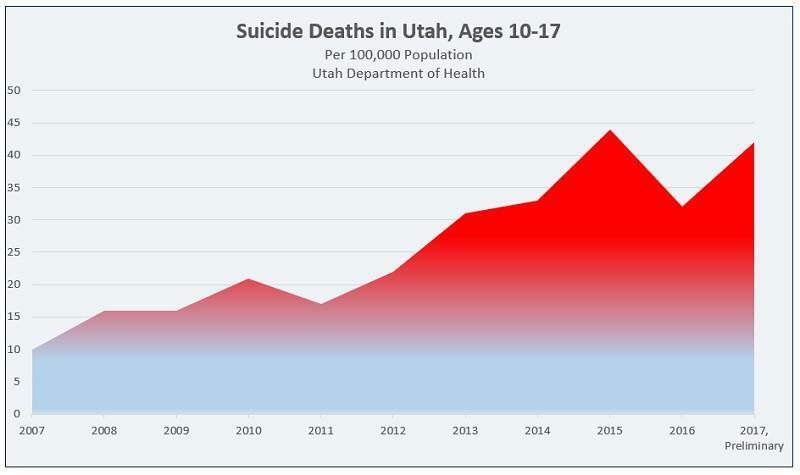 New data about suicide in Utah was released by the Centers for Disease Control and Prevention and the Utah Department of Health today, and it’s not good. Rates of youth suicide rose by over 140 percent in Utah in recent years.